KFC has finally done it — combined its famous fried chicken with waffles to create a Southern favorite. The chain went through 15 variations of batters for the Belgian Liege-style waffle served with the dish. 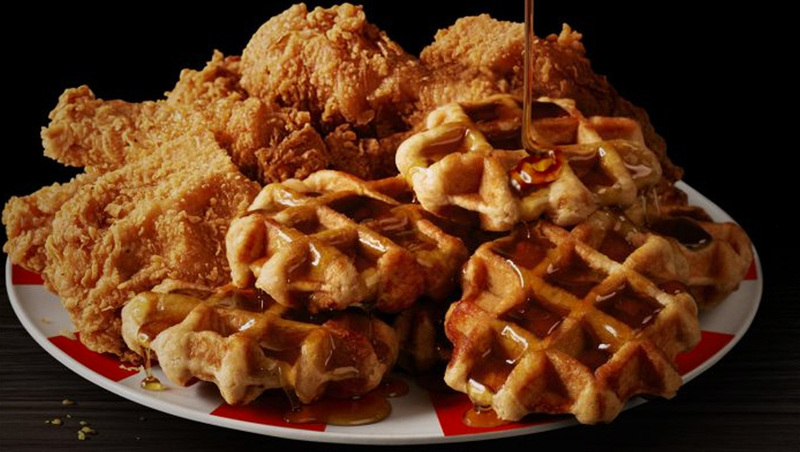 According to KFC, the taste profile of the waffle was developed specifically to blend with the “11 herbs and spices” in the chain’s secret breading recipe. The waffle is said to be sweeter and “doughier” than American waffles. The new dish is served as either a basket or sandwich. The basket features a choice of Extra Crispy bone-in fried chicken or tenders with a side of Mrs. Butterworth’s syrup. The sandwich features the chains “Hot Honey” fried chicken between two waffles.